Happy Sunday guys, it's been long since I wrote about blogger template, but today am dropping something big for you guys. Today am going to share another Magazine blogger template. Am sure you will love this. Today I bring to you, News52 Magazine blogger template well designed for Magazine, News and Entertainment Website. This Template doesn't seize to amaze me with its amazing Layout and professional design. 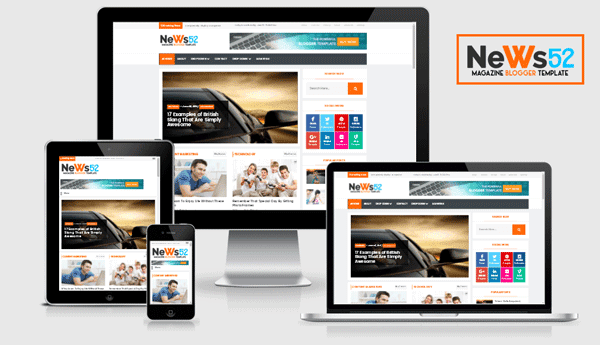 News52 is creative a d 100% Fully Responsive Blogger Template. Luckily, this Template is highly SEO Optimized Blogger Template that will improve your SEO, as I always said " SEO is the most important part of blogging". News52 is adsense ready, clean and modern magazine blogger template. The Magazine layout of this template is fully responsive that compatible with all devices. There are multiple social icons and an option to add your site logo on your footer section. What amazes me most in this template is the ability to use two comment box at a time (Blogger and Facebook comment box). This means that anyone that doesn't have a Gmail account can easily use the facebook comment box to comment. Don't forget to drop comments and share your on social media, if you find this post helpful..... Happy blogging..